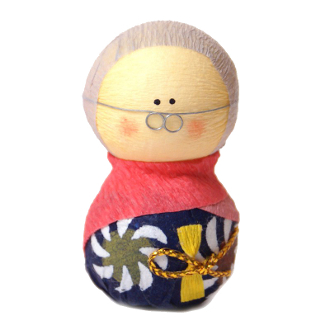 Okiagari-koboshi (getting-up little priest) is a Japanese traditional doll. The toy is made from papier-mâché and is designed so that its weight causes it to return to an upright position if it is knocked over. Okiagari-koboshi is considered a good-luck charm and a symbol of perseverance and resilience. Note: these dolls are about 2 inches tall.